This project has been abandoned. Moj is the alphabetic representation of the Qatama language. 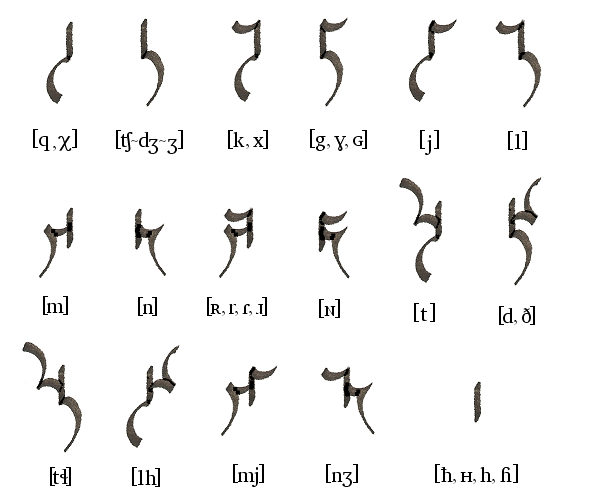 Moj and the Qatama conlang were invented by Qang for use in his conworld, Qatama. It was first created in mid 1999 and has slowly developed to its current form. Moj is written from left to right in horizontal lines, it may also be written vertically from top to bottom. The word moj not only refers to the script but also means "to write" in Qatama. 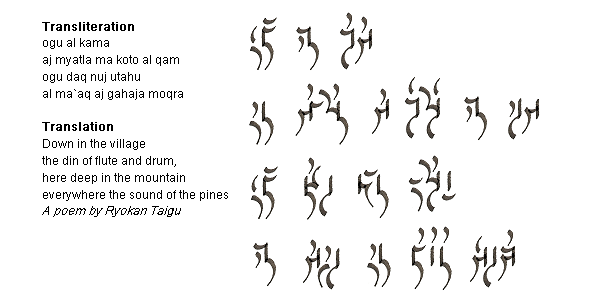 Moj was inspired by the Tibetan, Klingon, and Masonic writing systems. Moj contains 14 consonants, 4 vowel diacritics and 2 vowel carriers. The vowel carriers are used when a vowel begins a word or for diphthongs. The vowel carriers are not used when the script is written vertically. There is no punctuation used in Qatama, pauses, stops and questions are understood through the use of context and particles. The three different pronunciations of <j> are dialectal in Qatama. This is something I call mogua, it's a play on moj (writing system) + gua (face), if you look closely, every grapheme of Moj can be made with a combination of these brush strokes. This page was last modified on 7 September 2008, at 08:07.